A visitor walks by the U.
WASHINGTON (Reuters) - As the U.S. government moved to reopen after a 35-day partial shutdown, some lawmakers on Sunday criticized using the closure of federal agencies as a tool in policy disputes, which President Donald Trump has threatened to do again. Senior legislators from both parties said the latest shutdown, the 19th since the mid-1970s, was as ineffective as previous shutdowns but much more disruptive as it was the longest in U.S. history. "Shutdowns are not good leverage in any negotiation," Republican Senator Marco Rubio said on NBC's Meet the Press, urging congressional conferees to tackle border security in the three-week talks launched by last week's shutdown-ending deal. Hakeem Jeffries, chairman of the Democratic caucus in the House of Representatives, said on the same show that shutdowns were "not legitimate negotiating tactics" when there is public policy disagreement between two branches of government. About 800,000 federal workers stayed home on furlough or worked for no pay during the shutdown, missing at least two paychecks that officials are now working to make up for. "We hope that by the end of this week all the back pay will be made up," acting White House chief of staff Mick Mulvaney said on CBS's Face the Nation. 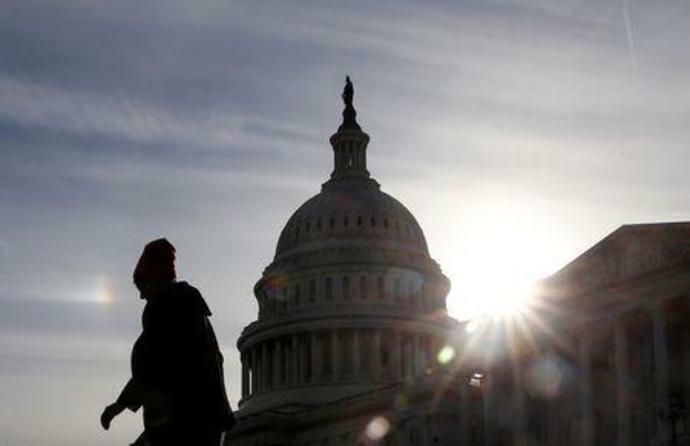 Democratic Senator Mark Warner and Republican Senator Rob Portman have introduced separate bills to prevent future shutdowns. Their prospects were unclear, but House Republican Leader Kevin McCarthy spoke favorably of them on Meet the Press. Trump retreated on Friday from his demand for funding for a U.S.-Mexico border wall that had caused the closure of about a quarter of the government. He also threatened to resume the shutdown on Feb. 15 if he does not get what he wants. The president had demanded that $5.7 billion in wall funding be part of any measure to end the shutdown, which started when several federal agencies ran out of money on Dec. 22 for reasons unrelated to immigration or border security. After polls showed Americans increasingly blamed him for the situation, Trump on Friday signed a measure to fund the government for three weeks as congressional negotiators try to work out a bill to fully fund it through Sept. 30. The White House held a conference call with Cabinet department financial officers late Friday to discuss the resumption of government operations. White House Office of Management and Budget acting chief Russell Vought told agencies in a memo to reopen "in a prompt and orderly manner." The Coast Guard told personnel it was "working through the weekend to process your pay as quickly as possible" and also said back pay should be received by Thursday. The National Aeronautics and Space Administration asked employees for "patience and attention, especially during the first 48 hours," noting that most employees' laptops and smartphones have been inactive for more than a month and have not had "critical, regularly scheduled maintenance." During the shutdown some agencies did not complete contracts for grants. The National Highway Traffic Safety Administration stopped reviewing new auto safety recalls. The Federal Aviation Administration stopped certifying some new aircraft and routes. The shutdown was likely to delay the rollout of Trump's 2020 budget proposal and congressional hearings on the budget. It remained unclear when Trump would deliver his State of the Union Address, which was postponed during the shutdown fight.